As mentioned in an earlier post I'm fairly inexperienced when it comes to growing Ariocarpus and still in the process of building a collection of these fascinating plants. 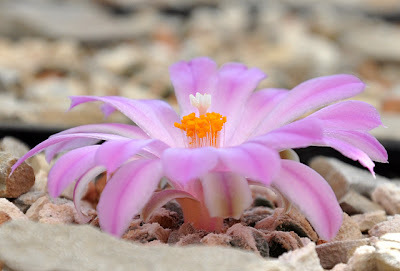 A few months ago I bought a handful of plants from Mesa Garden including three Ariocarpus kotschoubeyanus var. macdowellii plants (SB 100; El Pilar, Coahuila). I didn't really expect the plants to bloom this season but mid-September one of them greeted me with a beautiful, pale purple flower, so large that it completely covered the plant. 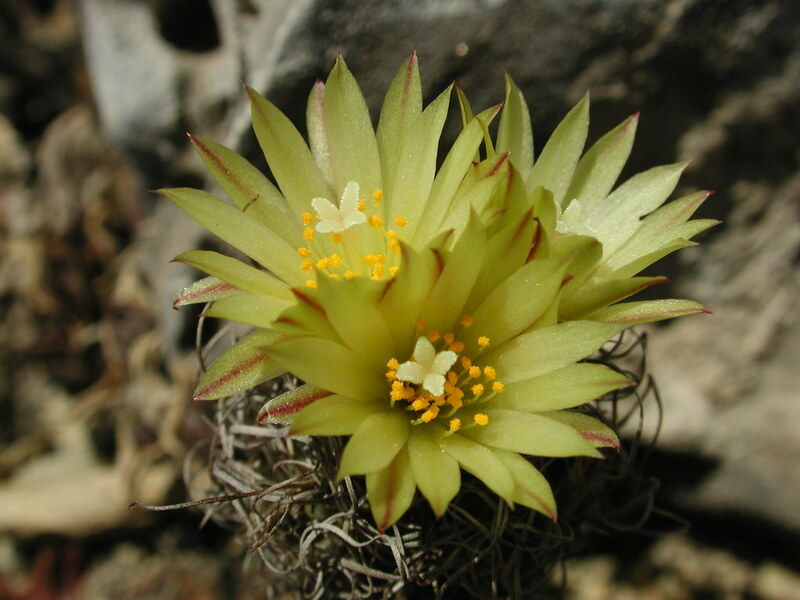 The northern populations are characterized by a form, which has become known as A. kotschoubeyanus var. macdowellii, this is found to the west and east of Parras with a range of over 100km from Viesca to Estatcion Marte in Coahuila. A. kotschoubeyanus var. macdowellii is a smaller plant than the type, with small beak-like tubercles and pale mauve flowers, often with a high white content in the outer petals. 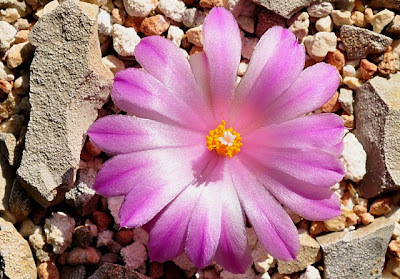 If the macdowellii plants survive the winter in the cold house I'm probably also going to test the larger, magenta flowered, southern form of the species, Ariocarpus kotschoubeyanus var. elephantidens. 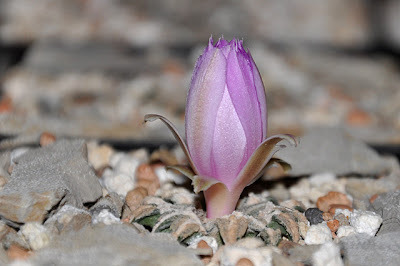 I'm growing the plants in a greenhouse at my summerhouse and can't check in on them on a regular basis, so it felt like a stroke of luck when I was met by a budding A. kotschoubeyanus var. macdowellii one late Friday evening in the middle of September. The next day the plant was in full bloom as illustrated by the pictures above. 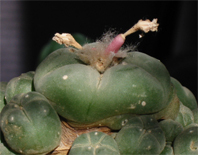 In early October one of the other macdowellii plants also developed a bud, but unfortunately I didn't see it flower. Regarding cold hardiness, the A. kotschoubeyanus var. macdowellii plants are going to be tested sooner than expected. Denmark has a cold spell coming and the weather report shows temperatures below -10 C (14 F) within the next few days. I was wondering when you'd have a new post up! Try to do at least two a month or I get inpatient, haha! What temperatures do you expect to have inside the greenhouse? That's a good question. The daytime temperatures will not be as cold as the -10 C nighttime low, but still well below freezing for several days. The inside of the greenhouse walls are covered with curtains and the plants draped in horticultural fleece, hopefully that will offer some protection from the freezing conditions. The winters have been extremely mild in Denmark the last few years and I have moved more tender plants into the cold house - I hope that hasn't been an act of hubris. On the other hand my "summerhouse plants" started out as an experiment in cold hardiness, so I guess I'll just have to follow through and wait and see what happens (I won't be able to see to the plants the next many days anyway). That being said, this cold spell certainly took me by surprise and follows a prolonged period of mild, damp weather. Kauderwelsch, beautiful picture by the way.